1) This is dinner. Summer parties are typically buffets and spreads. Treat them like dinner, not an extended cocktail hour. That means making a plate and stick to it. 2) Choose your indulgence.Here’s the fun part: pick a splurge. Will it be alcohol, chips or dessert? Once you’ve locked it in, ignore the others. 3) Know your food personality. If you can’t have chips and dip (serving size is 3 tbsp) without going back for more, or you can’t sample one dessert without wanting to try all of them, don’t start. 4) Pick one meat. At a BBQ, you may want to try a little of everything. Choose one meat and make that your main course. Also, skipping protein—or saying you will—only leads to picking and grazing and eating more than they would have in the first place. 5) Plate all your food. After you’ve picked your meat, make half your plate vegetables and add a fist-sized portion of one side dish. When you’re done, you should still be able to see the color of the plate. On my ideal plate, I’ve got a kebab (lean, great portion control and fun to eat) with corn, tomato salad and slaw— room for a cookie for dessert! BONUS TIP) Bring something good! Attending a deep-fried affair or gourmet gathering? Offer to bring something. My summer salads below have wow factor, and ensure that there’s something light and delicious on the table. Peel and cube 1 half seedless watermelon, about 4 cups. 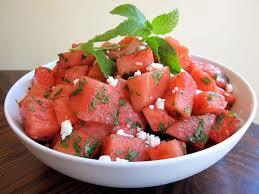 Just before serving, toss with 1/2 cup of crumbled feta and 1/4 cup of chopped fresh mint. Stephanie Middleberg, RD founder of Middleberg Nutrition a health and wellness practice in NYC.